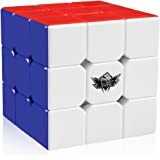 D-FantiX Yongjun Yileng Fisher Cube 3x3, a classic shape-twisted cube, different appearance makes it more interesting. 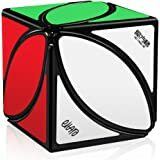 ULTIMATE GIFT FOR KIDS - No one falls out of love with the classic shape-twisted cube. Perfect Christmas / Birthday Gift for kids. They are always awesome and will never go out of style. Just Add to your cart now! YongJun Yileng is a classic shape-twisted cube, different appearance makes it more interesting. It uses the core of Yulong 3x3, combined with big hole design, which brings a good corner-cutting; inside feet structure avoids pop occur. It is a stable cube without bumpy feeling, definitely a magnificent shape-twisted cube. 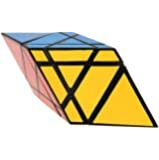 Using Yulong抯 core to make the cube more smooth and stable, brings better feeling when solve the cube. 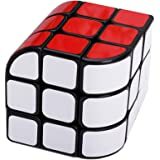 Cylinder design on center pieces makes the center piece combined perfectly with the core, which brings comfortable feeling when rotates the cube. Anti-pop design on edge pieces puts the pop problem to an end. 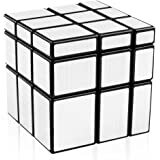 Round hole design on corners, edges and inside structure makes the cube has good corner-cutting and smooth feeling, avoids bumpy feeling when turning the cube. 5.0 out of 5 starsreasonable price. 4.0 out of 5 starsMore fun and challenging than it looks. 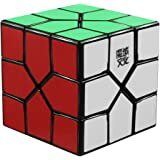 I bought this expecting it to function the same as a 3 x 3 but with a different look and feel to it, but apparently I was wrong. Aside from looking and feeling completely different, some added movements make it slightly more difficult. It still mostly functions like a 3x3 but apparently parities are possible cause I'm sitting here staring at this thing and it has both a corner and edge parity at the same time. I don't even know what to google to find a solution, but I will figure it out though! If I can do a 5x5, I should be able to do this. Also, Please note this is not for speed cubing. Its loose but there is no adjustable tension or spring at all. This thing will likely explode if you try to speed cube it. 5.0 out of 5 starsNot just colors, You have to solve shapes. I thought this was going to be a simpler version of a 3x3 cube. As it turns out you can really make twists and turns that make it no longer a cube, and it has lots of nooks and slants and pointy corners jutting out. Half the fun is just getting it back into a square cube, never mind the solving of colors. I have decided NOT to look online for solutions. Having a lot of fun. Don't want to spoil it. Some of the square 3x3 algorithms do work in certain situations, but some get you into trouble since the symmetry is not the same as the regular 3x3 cube. Highly recommend. 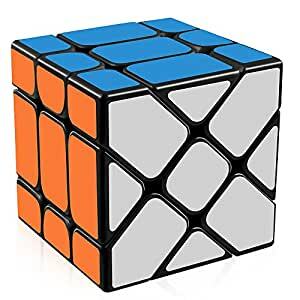 I have a traditional 3x3, 4x4, 5x5, pyramid, 12 sided, and this one. This one more fun that the others (though I do like the 12-sided one too). 5.0 out of 5 starsGreat cube! Great out of the box! The moment I opened this it felt amazing. It was smooth controllable and fast. It is a little smaller than I thought but I like it more than a standard 56mm cube. This is one of the best Fisher Cubes I felt and can not wait to feel it lubed and tensioned. I am not sure if I want to lube or tension it because I might mess up the great feel it already has out of the box. The color shades are also great. There is no confusing white and yellow or red and orange or blue and green. The stickers look perfectly placed and have no chips or peels at all. 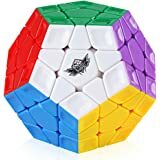 If you just got into cubing and bout a three by three and want a new cube, this is such a fabulous cube I might even recommend this to be your next cube to add to your collection. There was no problems with the shipping and arrive on time. This was a great buy, and I am way more than satisfied. Lastly, the feel is one of the best feeling cubes I have bought. In the first seconds I touched it I could feel the greatness. 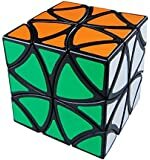 This puzzle is based of of the original fisher cube made by Tony Fisher which is a fairly simple mod but also very fun. 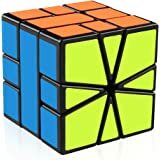 I would recommend this puzzle to beginners to introduce them to shape mods. 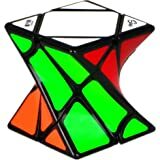 This cube is nicely made, looks nice, the colors are all very vivid, plus it comes with a nice little stand. Only thing I didn't like was that the turning was a little grainy, not really that smooth. Felt like a cheap material. But very good for the price.